This week I was out in San Jose, CA. (Okay, well if you happen to be my manager I am totally kidding. I was in Chicago the whole week workin’ hard and wishing I was in San Jose. Like, Brrrrrr! It was certainly cold out on the lakefront this week. And Argh!, that damn traffic on the Kennedy!!! Yeah, I was totally in Chicago…) Back in the day I was a regular out there flying the aptly named “nerd-bird” from Austin to San Jose every Sunday and every Friday. Now I just make it there on my own dime. Or dimes as the case may be. Yep, this week Mr. Engineer Boyfriend, the dog, a whole bunch of computer parts and gadgets (because you never want to leave home without your backup to your backup Cat 5 cable), and I headed the approximately 2163.76 miles to San Jose on American Airlines. The goal of course was to use up some Frequent Flier miles before they become as obsolete as an IBM Stock Option but funnily enough there was one member of the party who just couldn’t be paid for with miles and his name just happened to be “Myles”. Yep, the ‘ole puppers was gonna cost us. Now I should point out that this wasn’t his first flight of course but it had the potential of becoming his last. I feel it is my civil responsibility to educate all the other thirteen pound dog owners (and yeah, thirteen pounds quickly feels more like forty when said dog deadweights himself in the corner of the carryon bag) to the “dog-stortion” going down in the airline industry today. Read on. It all begins at the vet. Because everyone needs to get their cut on the whole “flying dog” thing, your local vet will charge you about seventy-five bucks for a printed receipt that shows you just paid two-hundred bucks to get your dog up to date on every vaccination known to man, dog and bird. Luckily, it is good for, oh say, about twelve days; enough to “get you there” but not necessarily “get you back”. Do this one time and one time only. There are many creative ways you can “alter” alleged certificate. Next there is the purchase of the “doggie vestibule”. For those of you, like my mom, who do everything within their power to avoid buying “name brands” best of luck to you. The airline only certifies the something called the “Sherpa” bag. Somehow the same guys that guide you up Mt. Everest have also created a monopoly in “doggie bags”. And these bags don’t come cheap. Mr. Engineer Boyfriend picked up a “Large” at Petco for $125 and complained about it the entire week. I should point out that allegedly every dog, including dogs much larger then my Myles, love this bag. Myles does not. Paws splayed in every direction a chicken strip would not even lure him into the bag (two French Fries from Burger King finally did the trick). And once inside, Myles whined incessantly. At one point I did go against my better judgment and allow him to stretch his legs (I don’t recommend this!) whereby he let me know what he thought of our little family vacation by leaving a present in the middle of Terminal “L”. My recommendation, drug ‘em. The coup-de-gras however is the cost of his ticket. As I mentioned before he does not qualify for Frequent Flier miles nor can he use them. (And trust me, I have asked.) The dog flies full-fare. 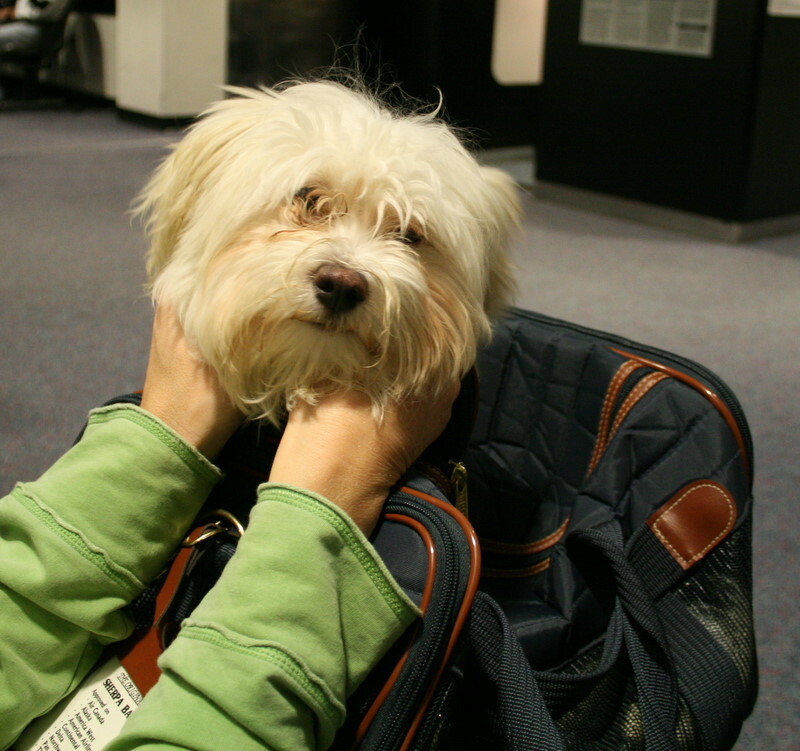 Yes, to stuff my little white dog in a carryon bag and shove him under my seat in the same way that I toss my laptop, ipod and latest romance novel, I pay a mind boggling one-hundred dollars – EACH WAY! Up from the eighty bucks I paid just six months ago (and promised that I would pay when I booked him the ticket in March might I add – still gonna take that one up with American Airlines!!!) All this and he doesn’t even get offered a drink of water, no nasty salty peanut/pretzel mix thing; Myles can’t even pop his cute little head out of the bag for a breather. This my friend is skyway robbery. And you know what, I might happily hand over my hard earned hundred bucks and begin to feel at least slightly sorry for the plight of the airline industry if and only if they focused on a little thing called customer service. Yes, American, I am talking to you, when I pay two hundred dollars to fly my dog on a four hour flight the least you could do is “throw him a bone”.